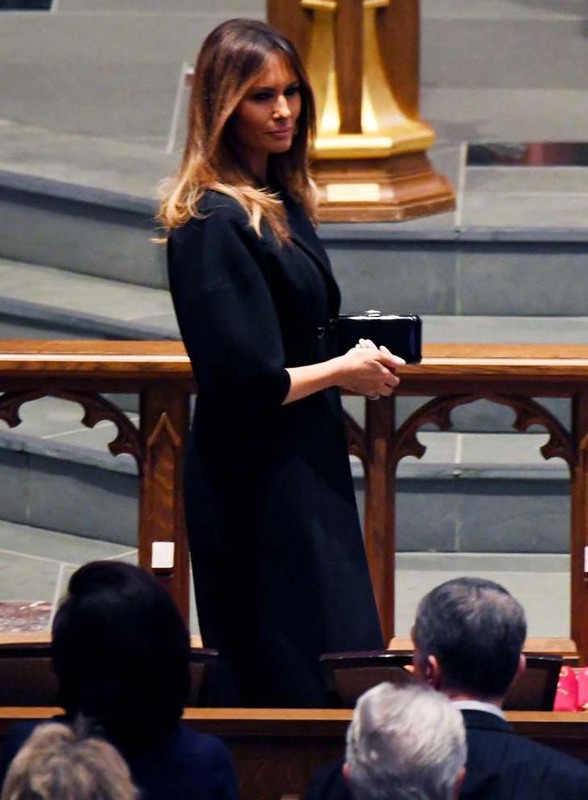 First lady Melania Trump brought two White House staff members who were close to the Bush family as her guests to former first lady Barbara Bush's funeral on Saturday in Houston. Trump was accompanied by former White House head maître d' George Hainey and current White House usher Buddy Carter, the first lady's office said. "She knew they were very close to the Bush family and wanted them to be able to pay their respects," spokeswoman Stephanie Grisham said. In a statement following the service, Trump praised Bush as "a woman of indisputable character and grace." "It was my honor to travel to Houston to give my respects to Barbara Bush and the remarkable life she led as a mother, wife, and fearless First Lady," she said. The first lady attended Bush's services in Houston on Saturday, while President Trump watched from his Mar-a-Lago estate in Florida. Former Presidents Barack Obama and Bill Clinton both attended the service, as did their wives. They joined George H.W. Bush and George W. Bush among the former presidents in attendance. Barbara Bush died Tuesday night at age 92. She had been hospitalized multiple times throughout the past year.